The lighter weight the fabric, the heavier the backing. Cutaway will provide more stability than tearaway. Pair a piece of light weight tearaway with No Show on light weight fabric. No Show is a must for all light colored fabric. Use Solvy to keep embroidery stitches elevated. 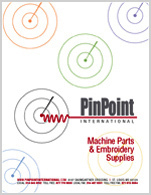 Stabilizers are crucial to the success of precision embroidery. The vast combination of fabrics and use requires the professional embroiderer to identify what works best for them in the most economical way. This is why PinPoint International offers a variety of high quality Backing, Topping and Specialty products. Our wet-laid non-woven products provide multi directional stability and consistent density so there is no give in any direction. The benefit of wet-laid backing is to only use one layer per embroidery application. If the embroiderer needs multiple layers, just switch to a heavier weight backing. Our premium stabilizer products contain silicone to provide lubrication to the needle through the embroidery process. We have created a quick reference users guide to assist you in selecting recommended stabilizer products for your embroidery applications. Remember, these are just suggestions, there are many variables affecting the embroidery process. Don't be afraid to experiment!